Back in 2002, Goldfinger released Spokesman, a track where John Feldmann criticised the generic, throwaway nature of music that seemed to be written by committee instead of having any genuine intent. It would be interesting to see how much Feldmann remembers of that today, given that his transition to pop-punk producer of choice has led to his name associated with the exact same stigmas – simplistic instrumentals, large chunks of lyrics swapped out for chants to fill space, and production that sandblasts away the slightest hint of texture and grit. Thus, it’s not out of the question to feel some sort of apprehension towards The Knife, Goldfinger’s first album in almost a decade and a chance for Feldmann to flaunt the clout he’s accumulated, recruiting blink-182’s Travis Barker, Twenty One Pilots’ Josh Dun and One Ok Rock’s Taka Moriuchi – amongst others – to lend some buzz to get the clickbait generation interested. If that sounds cynical, it’s because it is, mostly because The Knife is an incredibly cynical album. It morphs into the concentrated nucleus of Feldmann’s scene at an almost frightening rate, throwing together every one of his production tropes with precious little redemptive tissue between them. They come in thick and fast too – polished pop-punk numbers that easily could’ve appeared on blink-182’s California, the truncated guitar tones of 5 Seconds Of Summer and Good Charlotte, and metric tons of “Whoa-oh”s to let you know that, yes, you are listening to a project affiliated with John Feldmann. By this point, he should really know better too, as more often than not, these are the factors that neuter songs that, more often than not, aren’t that bad. The likes of A Million Miles and Put The Knife Away may be deep in modern blink-182 territory, but there’s at least some charm and bounce to them, and the appearance of Mark Hoppus on See You Around and Travis Barker at various points goes some way to legitimising these homages. Even better is when Goldfinger delve back into their ska roots, whether that’s the brassy spring of Get What I Need and Who’s Laughing Now or the baked, laidback Tijuana Sunrise, either way bringing in some more layered instrumentation that masks anything too overcooked. But even then, the overly slick, overproduced nature of The Knife makes it feel toothless more often than it should, muffling any heavier drums and paring back guitars to a state of critical malnourishment. That’s not even taking into account the songs that are just bad in their own right, like Don’t Let Me Go which pairs a watery reggae flow with an awkward guest appearance from Taka Moriuchi, or Orthodontist Girl, an attempt at a NOFX impression which is just embarrassing and more than a little cringeworthy. Perhaps even worse in that regard is Am I Deaf, which feels like Goldfinger are trying to remake Spokesman with Feldmann going on about the flighty nature of modern music and its listeners, and the complete lack of self-awareness coupled with his grumpy old man attitude means that the song pretty much collapses as soon as it begins. Sure, namecheck The Who and The Dead Kennedys as much as you like, but when you’re so far ingrained in the sort of material you’re calling the “problem”, there’s no grounds to complain there. But ultimately, that’s what The Knife feels like, an album designed to appeal to both longtime Goldfinger fans and the younger listeners who may only know Feldmann from his production credits and impressing neither. The older fans will be put off by how unnecessarily polished it is, and there just isn’t enough that’s memorable here to leave much of an impression on anyone. And while a handful of moments ensure that it isn’t completely dead in the water, The Knife overall feels like Goldfinger trying to catch up with modern sounds in a manner that doesn’t work at lot in general, but is especially true for them. 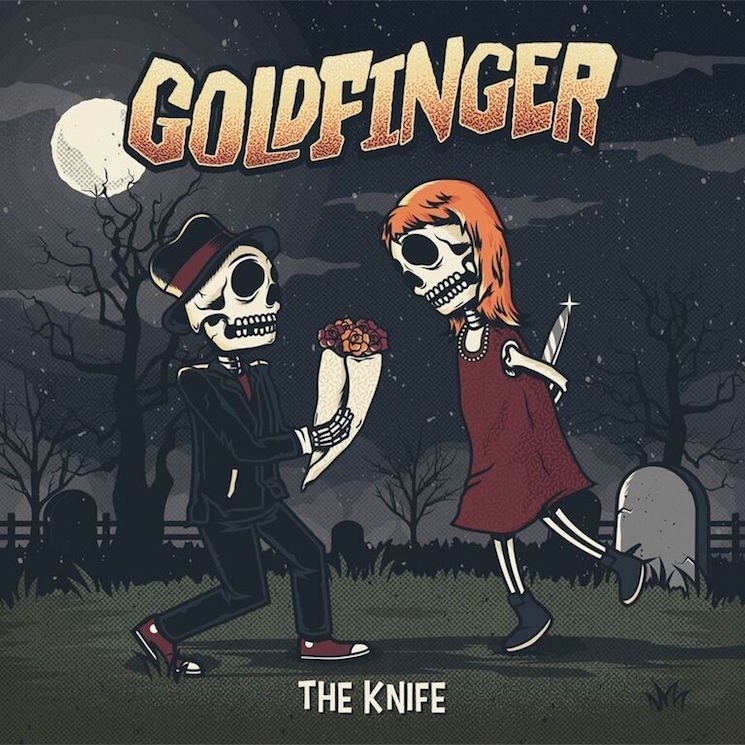 ‘The Knife’ by Goldfinger is released on 21st July on Rise Records.